Stainless steel derives its corrosion resistant properties from its chromium content. The chromium, in the presence of air, especially oxygen, forms a thin, hard adherent film of chromium oxide on the surface of the alloy. It is this chromic oxide layer that is inert (passive) to the surrounding environment and gives stainless steel its corrosion resistant properties. Simply stated, utilizing a mild oxidant, such as a mineral or organic acid solution, to promote the removal of excess iron from the surface of the stainless steel will enhance the formation of a chromic oxide layer thereby enhancing its corrosion resistant properties. 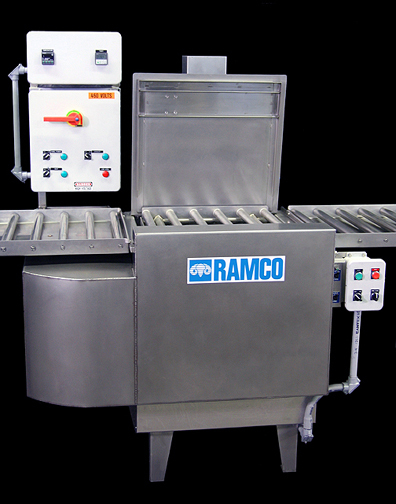 Typically, passivation is performed with a nitric acid bath from 20 to 50% by volume. Temperatures range from ambient to 160 degrees F. Immersion times can be as long as two hours and even include the addition of a chromate salt. Nitric acid is by far the most accepted means by which passivation is performed. The following Case History is of a Nitric Acid Passivation System for precision components. The system consists of seven stages comprising two MKT Consoles and a single stage Nitric Acid MK Series. Due to the nature of Nitric Acid and its fumes the electrical and pneumatic systems are built for corrosive environments. This includes Nema 4X electrical components and enclosures as well as special pneumatic components specifically designed for this application.